Long time no blog… I’m surprised WordPress still remembers me. It’s still the best place to post shiny pictures and remembrances for internet posterity though, and boy, do I have a bunch of shiny pictures. 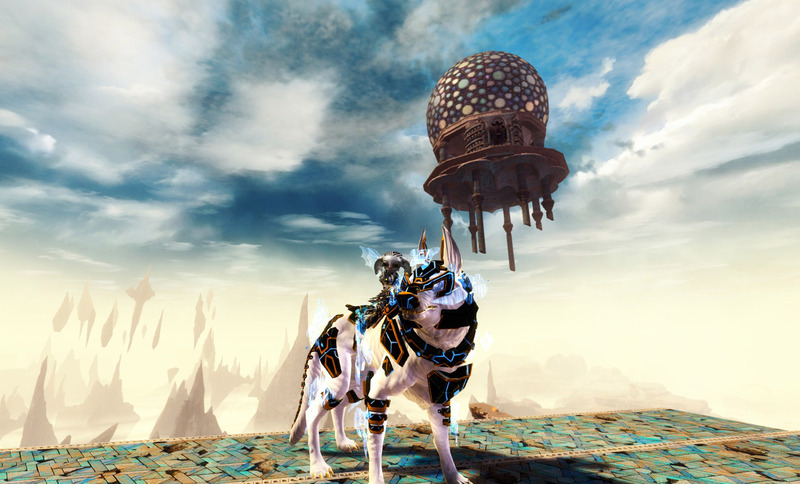 GW2 released yet another bunch of gem store mount skins a day or two ago – the Exo Mount Pack, which are basically a bunch of robotic/holographic armor plates strategically pasted onto the basic mount with the increased 4 dye channels common to gem store skins. It doesn’t seem to have been terribly well received on Reddit. It’s something I’m considerably thankful for, because I love ’em. The price point is also pretty reasonable in my book. It’s ostensibly set at the established 2000 gems for a mount pack of 5 skins (like the Halloween Spooky Pack and the Branded Mount Pack) and then released at a “discounted” 20% off at first launch, or 1600 gems. In other words, $20usd for the 5 skins. Pretty cheap when $25 single mounts are an established price point in other games. The only problem is that I’m still having sporadic high ping issues (and I mean, 300-500ms annoyances and completely unplayable 2000-3000ms spikes), thanks to Arenanet’s cost-saving measure of shifting operations to Amazon Web Services and the vagaries of internet routing. Just like when I’d previously faced the cognitive dissonance of wanting to do all content (including raids) but not wanting exclusive legendary armor stat-swapping functionality, my equally established stance is not to spend a damn real-money dime in support while I’m unhappy. But the skins… they are so SHINY. And I have SO MANY ASURA that could use ’em. Thankfully, since few other people seem interested in ’em on Reddit, the currency exchange has held relatively steady and not spiked excessively. After more cognitively dissonant brooding, I decided to bankrupt myself in-game, withdrawing nigh every single gold stashed away, and exchange 465g for 1600 gems, which were promptly blown on shiny mount skins. I have no idea why people aren’t impressed by them. I love their versatility. My condition berserker warrior is naturally themed towards fire, and a bit of playing around with dyes produced this shadowy holographic fire jackal. 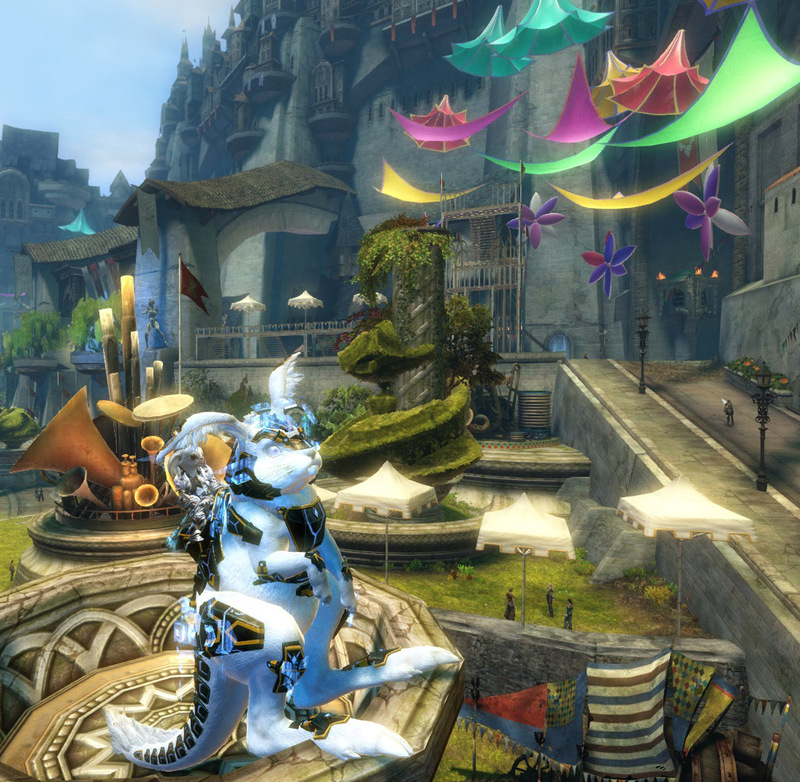 On the other side of the color spectrum, my asura guardian has been using the blue Super Adventure Box holograms as part of his schtick since the first April Fool’s. 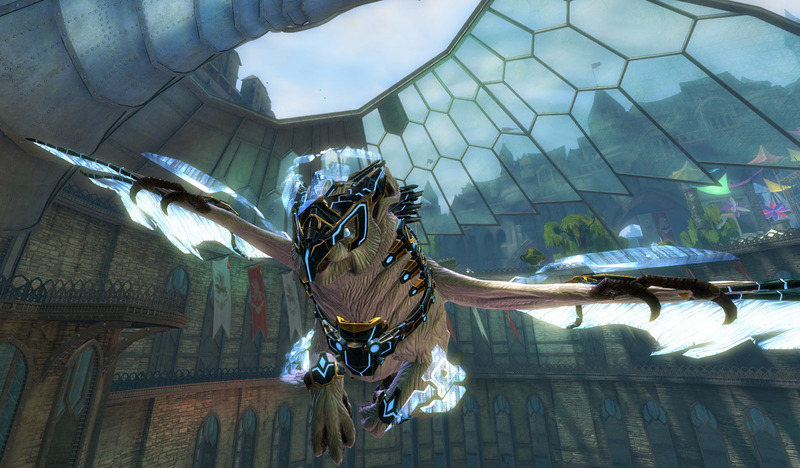 Celestial white guardian griffon ho! Someone call for Easter guardian bunny? 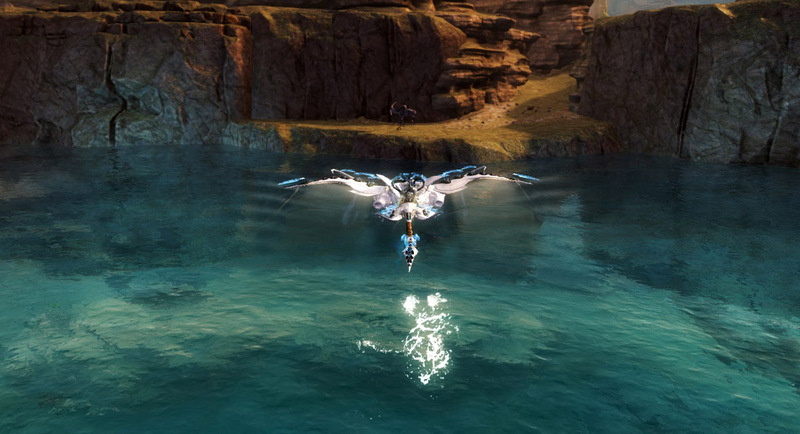 I discovered it’s nigh impossible to take a screenshot of the front of the skimmer while you’re skimming across water, but even the back looks nice. And let’s face it, this is the view of your mounts that you see most often. I haven’t even gotten around to figuring out good color schemes for my naturalistic asura ranger, and as yet not very background-developed asura thief, elementalist, necromancer, mesmer and revenant… but I’m sure I’ll stumble on some mix of dyes that fit eventually… with different and equally fantastic results. 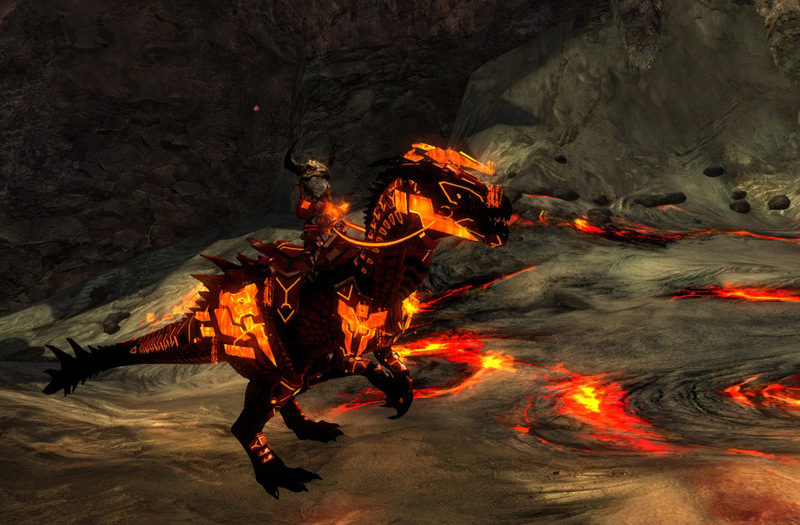 This entry was posted in Guild Wars 2. I have literally not seen a single one of those skins in game yet. I use my own mounts so infrequently now that I genuinely forget I have them. I see other people zip past me on their bizarre rides and it literally doesn’t occur to me that I have the option to mount up myself. I think it has something to do with mostly playing WvW and also to having three accounts, two of which don’t have mounts. That said, I routinely fall to my death on the base game account because I forget that one *doesn’t* have gliders so maybe it’s just that I think mounts are crap. Still regret giving them money for the latest expac, even though by doing so discovered I really like the content from the previous expac quite a bit. 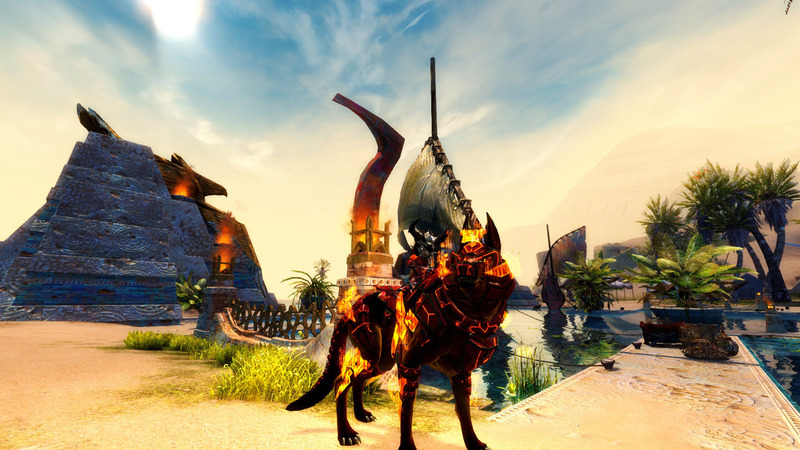 But Anet itself is a dispicable company – do just a little research and you will find there is no work by them to prevent hackers in PvP as long as gold and the real money market is not affected.